MARCH 28 — Former Prime Minister Tun Dr. Mahathir Mohammad recently warned that the US, together with unidentified Jewish groups, is plotting to engineer regime change in Malaysia with the intention of putting a pro-American puppet regime in Putrajaya. Chandra Muzzafar, a well-known academic and political thinker, subsequently endorsed Dr. Mahathir’s concerns in an article which appeared in The Star — a leading mainstream newspaper. Regime change is very much in the vogue these days. It implies a change of government, usually an undemocratic one, by outside intervention. The concept of regime change became popular during the Bush Jr. Administration which considered that America could and should remove regimes that were hostile to US interests. This is nothing new. Big powers like America, Russia, Britain and France have been in the business of regime change for decades. History is littered with their handiwork. In more recent times, regime change has taken place when a case could be made that a particular regime was a threat to international peace – as was the case, wrongly as it turned out, with Saddam Hussein – and/or to protect civilians under assault from their own government – as was the case with Muammar Gadhafi. Critics who argue that Western democracies have a shameful history of using regime change as a convenient way to deal with recalcitrant governments or install more pliable leaders in key, usually resource rich, countries are quite justified in their conclusions. Western democracies were, for example, quick to invoke the “responsibility to protect civilians” principle in the case of Libya, whose mercurial leader was never liked despite giving up his weapons of mass destruction. When civil war broke out in Libya last year, Western democracies quickly sided with his opponents and affected his removal from office. The people of Bahrain, facing the same predicament, however, were not extended similar protection. Bahrain plays host to the US Fifth Fleet and is thus a critical ally. Membership has its benefits, as the old American Express Card advertisement used to boast. Is Malaysia realistically on the cusp of regime change? Malaysia, particularly under the Najib Administration, has developed very close relations with the US. Najib Razak is perhaps the most pro-American prime minister Malaysia has ever had. Najib Razak has responded positively to American concerns that Malaysia might be used as a trans-shipment point for critical dual use technology by certain states intent on building nuclear capability. Najib Razak has also embraced American leadership of the region through his support for the Trans-Pacific Partnership and has distanced Malaysia from US arch-enemy Iran, who together with Malaysia is a member of the Organisation of Islamic Cooperation. Military cooperation, excellent even in the days of the Mahathir Administration, has reached new levels. With all the old irritants of the Mahathir years gone, Malaysia has entered a new era of bilateral relations. There is, in fact, smug satisfaction in Washington these days over the state of Malaysia-US bilateral relations and the praise from Washington has never been more effusive. Even during the Mahathir years, when relations were at a nadir, there was no talk of regime change. In any case, Mahathir himself was always careful to ensure that his rhetoric never affected the core of the relationship with the US. He understood the limits of dissent and prudently stayed within its bounds. Furthermore, American policy makers are far more concerned with political stability these days than they are with freedom and democracy and embrace change only when it is forced upon them. Egypt is a case in point. Malaysia, despite its many problems, does not have the kind of instability that would worry the Americans and neither does the internal situation lend itself to regime change strategies. The conditions for external intervention are, therefore, just not there. Both Mahathir and Chandra also invoked the spectre of Zionism in regime change in Malaysia. Bogeymen have, of course, always been prominent in Malaysia’s political discourse. It seems like some one or another is always conspiring against Malaysia. If it’s not the Zionists, it’s some other equally nefarious group waiting in the wings to take over the country or subjugate Malaysians. In any case, despite the anti-Semitism, Malaysia seems to have quite a good relationship with the Jewish state. 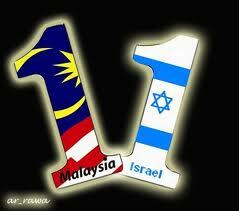 Some reports suggest that Malaysia is already Israel’s 15th largest trading partner. There have also been quite active exchanges of diplomatic correspondences and quiet meetings between Malaysian and Israeli leaders. Mahathir himself regularly met with American Jewish leaders during his time in office. Nevertheless, the Leader of the Opposition appears to have landed himself in a pretty pickle over his comments on Israel. His nuanced concerns about Israel’s security undoubtedly won him much applause in the US but, as he should have known, such nuances are easily lost in translation at home where unequivocal support for Palestine, at least publicly, is non-negotiable. The reality is that, with or without diplomatic relations, Malaysia has to deal with Israel if Malaysia ever hopes to truly champion the Palestinian cause, promote Malaysia’s views and enhance Malaysia’s interest. Most Arab countries do far more. Regime change, if it does come to Malaysia, will more likely come through the ballot box. Perhaps this kind of change is worrisome to those who cannot countenance change, even democratic change, no matter how remote the prospects are.